Place your trust in God with full confidence in this sweet "Trust Script" Cherished Girl® T-Shirt in Indigo Blue. Your casual style can make a powerful reference to your faith in — and love for — Jesus Christ. Every single person you meet longs for meaning in their life, and dependable relationships that won't let them down. A conversation with you about the saving grace of Jesus could change someone's life for eternity. Proverbs 3:5 says, "Trust in the Lord with all your heart and lean not on your own understanding." We are all looking for someone to put our trust in, and at times we can't even depend on ourselves. Our Creator God has a good plan for our lives, and although He doesn't always give us the answer we expect, He is always present, and loves us infinitely. Share the Good News that God is worthy of our trust, and a relationship with Him is life-changing. Change your shirt — and you can change the world! 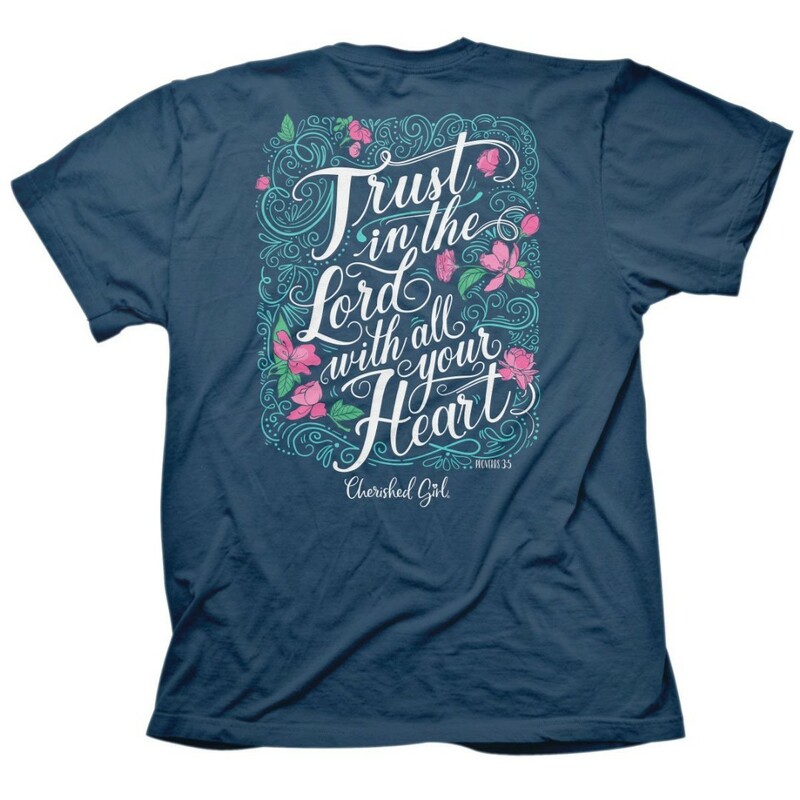 Trust Script T-Shirt, Medium was published by Kerusso in January 2019 and is our 7649th best seller. The ISBN for Trust Script T-Shirt, Medium is 612978477618. Be the first to review Trust Script T-Shirt, Medium! Got a question? No problem! Just click here to ask us about Trust Script T-Shirt, Medium.